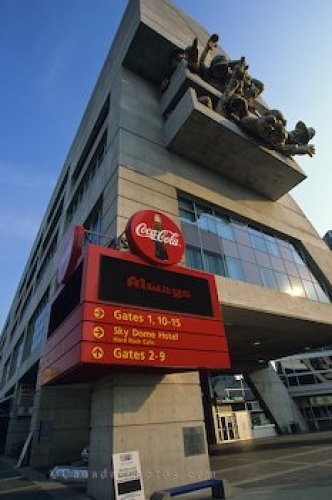 A large red sign gives directions to the proper gate as statues hang over the balconies above outside the Toronto Skydome Stadium. Not only is professional baseball played at the Skydome which opened in 1989 but attached you will find a hotel where 70 of the rooms overlook the field as well as a Hard Rock Cafe. Outside the Skydome Stadium in Toronto, Ontario, Canada, North America. Picture of a sign directing people to their section outside the Skydome Stadium in Toronto.